Daytime hours are prime time for many communities’ central business districts. While vehicle, pedestrian, and commuter traffic can peak during the morning and evening rush hours, a downtown area can be busy all day long. Because of all this activity, downtown tree trimming operations can be disruptive to residents and businesses. Plus, our trucks can take up prime parking spaces or block off road access. When our workers are up in the trees, a wide area must be cordoned off for their safety, as well as for the safety of drivers and pedestrians. Many area downtowns have a large number of trees, so trimming can take days. There’s a lot of equipment that comes along with commercial tree care and doing it at night can alleviate any inconvenience to residents. By conducting our trimming overnight, our workers were able to create safety areas that didn’t also create bottlenecks—and frustration among residents. As tree care professionals, we serve both residential and commercial property owners with tree trimming, tree removal, stump removal, tree identification and inventory, advanced thermal tree imaging, land clearing and restoration, and maintenance programs. 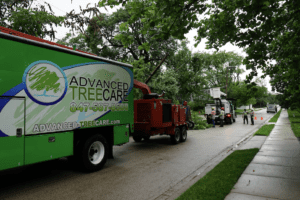 We are the exclusive contracted tree service provider for ten cities, multiple park districts, and other government agencies, managing over 60 square miles of urban landscape trees and shrubs in 13 counties in Illinois and Wisconsin. If you’re interested in discussing how nighttime tree trimming can work for your municipality or corporate campus, reach out to us. We’d be happy to create a schedule that works for your community. Just like humans, trees require comprehensive care because they’re complex beings. Because of this, we look at trees through two lenses when it comes to providing services for our customers. Doing so lets us truly cement our reputation as Advanced Tree Care. When we talk about a tree’s physical health, we’re really talking about how everything about the tree is working well together. When physically healthy, a tree should have an overall healthy appearance from roots to canopy. Its leaves should be thick and green (except, of course, in fall, or if the tree is a variety that has a non-green leaf). Those leaves shouldn’t display bumpy scales, powdery substances, or any other signs of widespread infestation or damage. Unless it’s late in the fall, its leaves should not be showing signs of stress, discoloration, or dieback. Trees have complex systems like the human body, so it’s important to recognize and treat troubling symptoms. The tree’s canopy should be thriving. While some trees will have dead branches, a physically healthy tree will have no more than 17% dead branches compared with its entirety. The branches and limbs should be free of any disturbances, insect holes, bleeding, peeling bark, mushrooms, or other problems. The trunk should also be similarly healthy—no loose or deteriorating bark, obvious insect holes, or other signs of stress or decline. At the base of the tree, the root flares should be free of any soils, mulches, and debris. Root flares, especially of mature trees, should be pronounced—meaning you’re able to see them and they crest over the top of the soil. These details are all the things our experienced staff and certified arborists consult when assessing the physical health of any tree we care for. A tree’s structural health has to do with the strength and soundness of its overall structure. In a structurally healthy tree, the limbs and branches are free of inclusions, bifurcations, embeds, rubbing, and competing limbs. 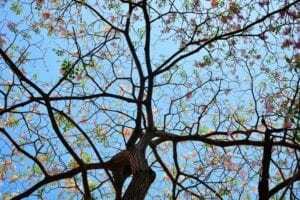 Though these are terms specific to tree care, the concept is simpler than the words suggest: if your tree’s branches look complete, distinct from another, and are growing healthy and separately, your tree is likely to be structurally healthy. If its branches don’t fit this description, it may be time to consult a certified arborist. The tree’s limbs and trunk should also have good taper—meaning the limb and each branch start wider and gradually thin out. Branch distribution should be relatively even around the trunk and throughout the canopy, and the tree should be free of bark disturbances. An array of factors can affect a tree’s structural health: age, infestation, disease, weather, and accidents all factor in. So do particularly hot summers and particularly cold and icy winters. Now that you know the difference between physical health and structural health when it comes to trees, we hope you’ll be looking at the trees in your yard with new eyes. And if you notice anything that raises an alarm, be sure to call on a certified arborist to assess the health of your tree. When Do I Need a Professional to Handle My Tree Care? Trees make up about 15% of your overall yard landscape. While 15% doesn’t seem like a lot on the surface, think about how important your trees are. They provide shade, they provide visual variety, and they’re a long-lived member of your ecosystem. Trees can also be costly to replace or remove. Caring for them properly is not only the right thing to do for the environment, it’s the right thing to do to protect your investment. Any signs of stress, deterioration, or disease should be a clear indication that a tree health diagnosis—provided by an ISA Certified Arborist—is in your best interest. Tree care can be tricky and costly, which is why hiring a certified arborist is the best way to protect your property. If you’re noticing any of these signs, calling in a certified arborist can help you address a situation before it worsens. There are certainly conditions under which a tree cannot be saved, but there are plenty where an early intervention can save a beloved tree. Just imagine your yard without that grand oak in the corner or the beautiful maple shading your front porch. When in doubt, call us to come on out. 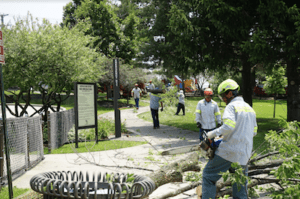 Why Would You Hire a Certified Arborist? Simply put, an arborist is a true professional in the art and science of tree care. 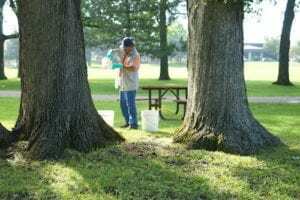 He or she has spent at least three years in full-time arboriculture work, has prepared for and taken a comprehensive examination, and has agreed to a code of ethics regarding professional conduct. But when rubber meets the road—or roots meet the soil, per se—what is the difference in service a certified arborist can provide? There can be big risks to your property and family when tree care is not done to the highest standards of a Certified Arborist. When we talk about a certified arborist, we’re referring to a professional who has qualified as an International Society of Arboriculture (ISA) Certified Arborist. He or she has had hands-on experience for three years in pruning, cabling and bracing, tree climbing, tree installation and establishment, disease identification, removal, and more. Then, he or she has passed an exam that covers a range of topics on tree maintenance, emergencies, and care. Recertification happens every three years. Tree care is complex, and mistakes can be costly. When a winter storm has rolled through and downed a huge old tree across your power line, or your garage is threatened by a weak branch, you want a certified arborist to handle the job. Other situations may be less immediately dangerous but no less important: warding off disease, enhancing your yard, or choosing the right species of tree that will thrive in your space. It takes a great deal of knowledge and experience to understand all aspects of a situation—and what a tree (or its owner) may really need. Ensure you’re entrusting your trees to the best care—choose a tree service that’s led by a certified arborist. As with any other professional service, you’ll also want to consult customer reviews as well as reference the area of service, or the geographical range in which the tree service provides care.